The delivery of the first Boeing-built KC-46 tanker aircraft to the U.S. Air Force was postponed following the resignation of Defense Secretary James Mattis, Defense News reported Monday. A source said the service branch was scheduled to receive the first tanker on Monday but leadership changes at DoD stalled the decision on KC-46. “KC-46 remains a top priority and we look forward to delivering tanker aircraft in partnership with the Air Force,” said Kelly Kaplan, a spokeswoman for Boeing, told the publication in a statement. 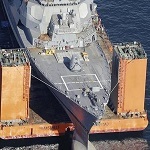 The report noted the decision on the tanker delivery may fall to Ellen Lord, undersecretary for acquisition and sustainment at the Pentagon, or Air Force Secretary Heather Wilson since Deputy Secretary of Defense Patrick Shanahan is a former executive at Boeing. Mattis announced that he would leave his post by the end of February but President Donald Trump tapped Shanahan days after to serve as acting DoD secretary starting Jan. 1.